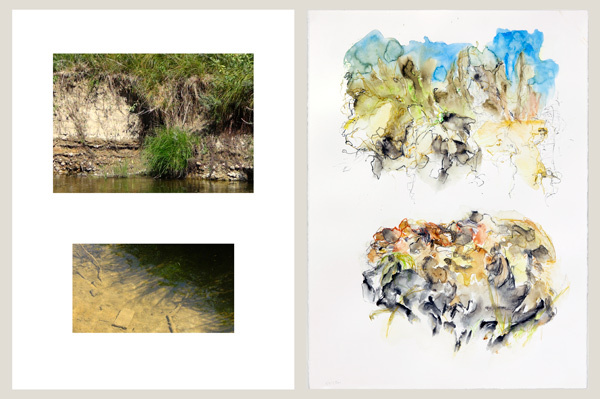 Margaret Cogswell (American), develops her River Fugues through extensive research that includes traveling to observe, listen, and record both the general and specific landscapes, and search for that particular sound or image that captures the pulse of the rivers, the surrounding landscapes and life. Narratives from individuals who live or work along the rivers, or whose research and work focuses on the natural resources surrounding the rivers, have informed the direction of the development of Wyoming River Fugues. The resulting installation explores the complex relationship between Wyoming's natural, cultural, historic, engineered, and industrial landscapes. Using the musical structure of the fugue, Cogswell edits video and audio components captured during her research into passages that reflect thematic repetition and variation. These are often embedded in the industrial-like sculptures of the installation, their machine-like form referencing efforts to control or harness river waters for industrial and agricultural gains. Margaret Cogswell discusses her "Wyoming River Fugues" which was developed through extensive research that includes traveling to observe, listen and record both the general and specific landscapes; and search for that particular sound or image that captures the pulse of the rivers, the surrounding landscapes and life.